Look inside the pages of a children's picture book and you'll often be inspired to expand your imagination as you experience the visual dazzle of an illustrator's artwork combined with superb storytelling. Stories, such as those, enrich our lives -- they are personal yet universal; timely, yet timeless. And, story-telling is what Storyopolis is all about! Storyopolis is manned by a dedicated staff of yarn-spinners, tale-tellers, and book and art lovers who want to help you nurture (and tickle) your children's imaginationas well as your own inner child. Storyopolis is a unique art gallery and bookstore that showcases the best in storybook illustration. Storyopolis has special events for families every Saturday, along with selected events during the week. Check out their events calendar and sign up for many free events held throughout every month. 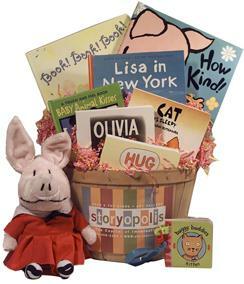 You can also order a special gift called a Storyopolis Book Bushel! Practical, yet impressive, hip but classic -- a library and mind-expanding experience wrapped up in ribbon and cellophane. Their Book Bushels are 'custom-stuffed' to fit every age, taste, occasion, and budget (starting around $75). The Storyopolis Book Bushel is not another muffin, wine-cheese, coffees-of-the-world, fruit-basket, monogrammed-towel, pen-se - it's a gift that will be remembered. Simply call one of their knowledgeable and friendly Storyopolizens at 1(800)95-TALES where they will ask you a few simple questions like age of recipient? event date? recipient's interests and hobbies? first child? siblings? include a specific title? message on card? shipping or messenger? size of basket? and credit card. Monday-Saturday: 10:00 a.m. - 6:00 p.m.